Escape to Old Manali for the weekend and check in to Shobla Pine Royale. Situated on the banks of River Beas and overlooking snow-capped mountain peaks, everything about this cottage in the hills is dreamy and romantic. Each of the rooms open up to a balcony and breathtaking views of Rohtang and Hampta Pass. Sit back and listen to the sound of the river Beas rushing over pebbles, while you sip on a cup of chai with your SO. Done up primarily in wood, the rooms are understated, yet elegant. They’re equipped with a mini bar, coffee maker and running hot water so you’ll be very comfortable here. 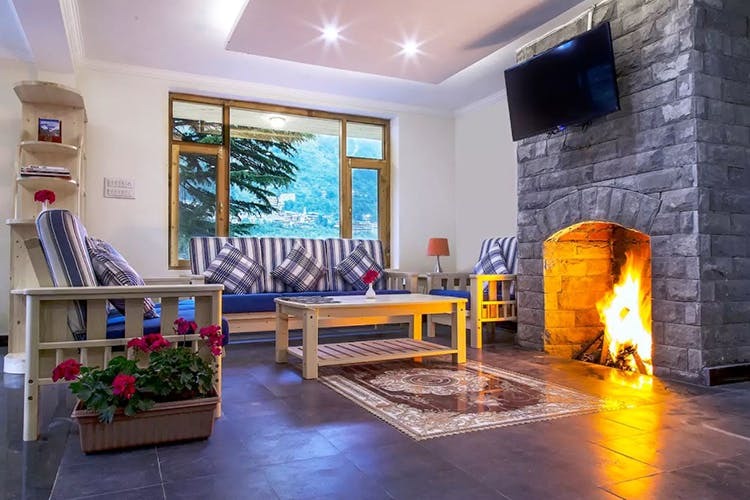 Wake up to hot, buttery parathas and then, challenge bae to a game of Scrabble in the common living area, before you head out to explore Old Manali together. If you’re a stickler for lists and planning, here’s what your romantic getaway needs to include: Some adventure sports (you could go rafting on the Beas river or paragliding in Solang Valley), a trip to the Roerich Art Gallery so you can be fancy and admire the work of Russian painter Nicolas Roerich, and a riverside picnic for two. Don’t forget to share a plate of Maggi as you watch the sun set over the mountain tops. The best bit about your stay at Shobla Pine Royale is that it’ll be budget-friendly – less than INR 4,000/night (inclusive of breakfast). This has ‘weekend getaway’ written all over it. The cottage is not situated in the main area so most touristy attractions will be a bit far away. But on the bright side, you can sleep peacefully without any noise.